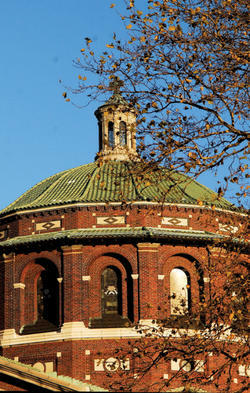 Home > Winter 2011–12 > Were You Married in St. Paul’s Chapel? Photo: Eileen BarrosoEvery year, about 60 couples get married in Columbia’s St. Paul’s Chapel, and in more than 90 percent of the cases, one or both members are alumni of the College, Barnard or Engineering. If you were married at St. Paul’s, please share memories of your wedding — we look forward to hearing from you (chaplain@columbia.edu). St. Paul’s is a historic NYC landmark and an architectural gem, with original furnishings including an Aeolian Skinner organ, one of the finest examples of 20th-century organ building. For inquires about weddings in St. Paul’s, please contact Robert Doyle, assistant director, Earl Hall Center: rd2521@columbia.edu or 212-854-6242, or visit the University Chaplain's website.